Instant Pot Burrito Bowls are perfuming my kitchen, like a savory potpourri. I wish I could scoop you all up and put you in my kitchen right now. 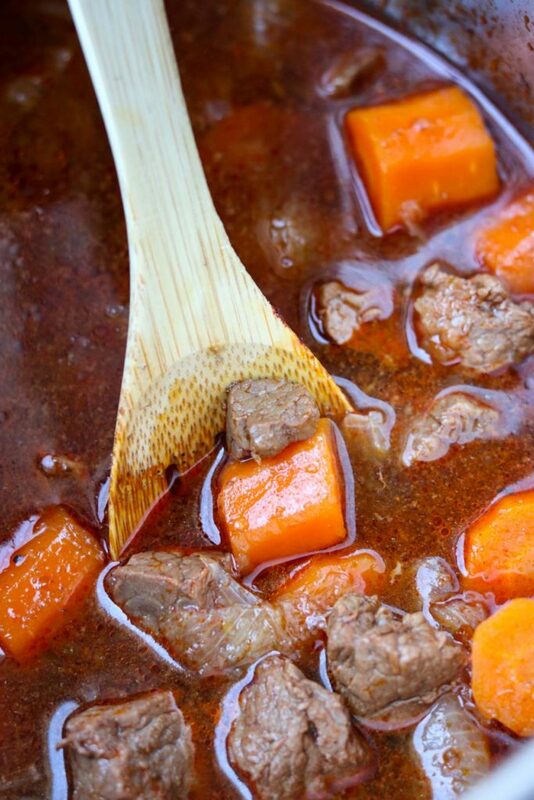 I just popped the vent open on my Instant Pot and my whole kitchen smells like heaven with scents of steak, chili powder, cumin, onion, and sweet carrot. What a delicious blend! 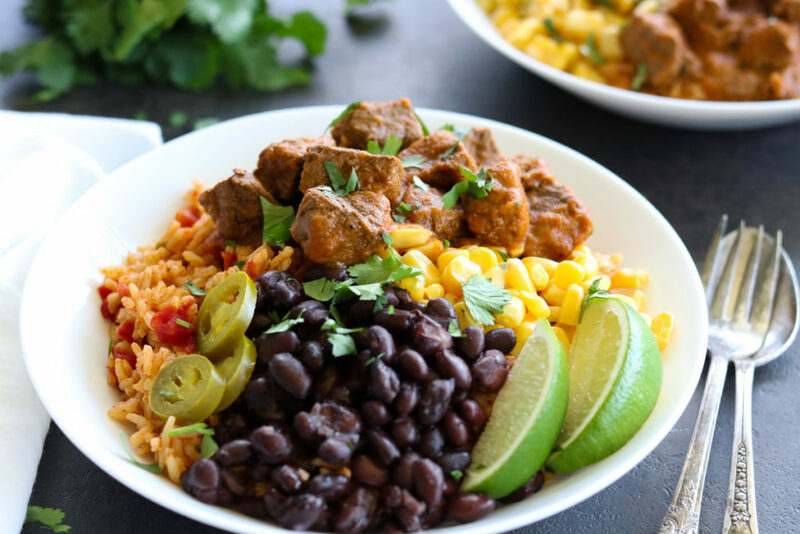 If you love Mexican food, burrito bowls, and your Instant Pot like I do, then this recipe for Instant Pot Burrito Bowls is the perfect recipe for your dinner this week. 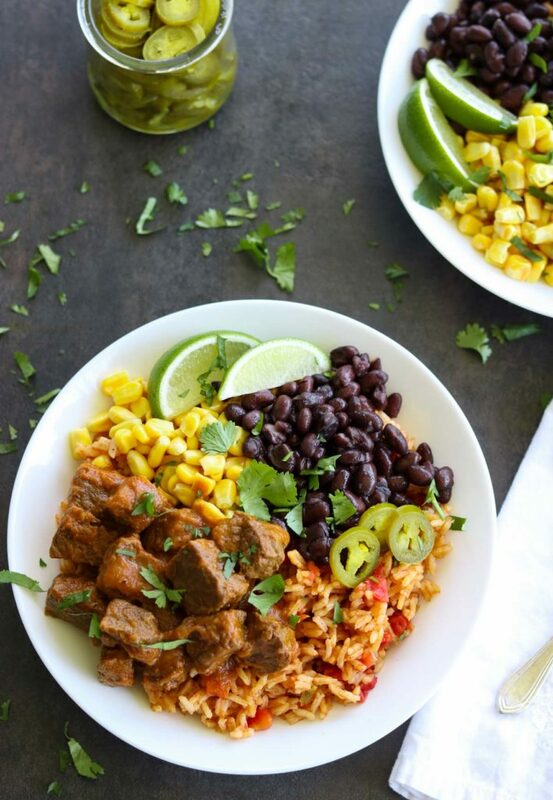 These burrito bowls are full of fork tender steak, seasoned with flavors of cumin, chili powder, garlic and onions, mixed with a sweet, salty, & spicy blender sauce. 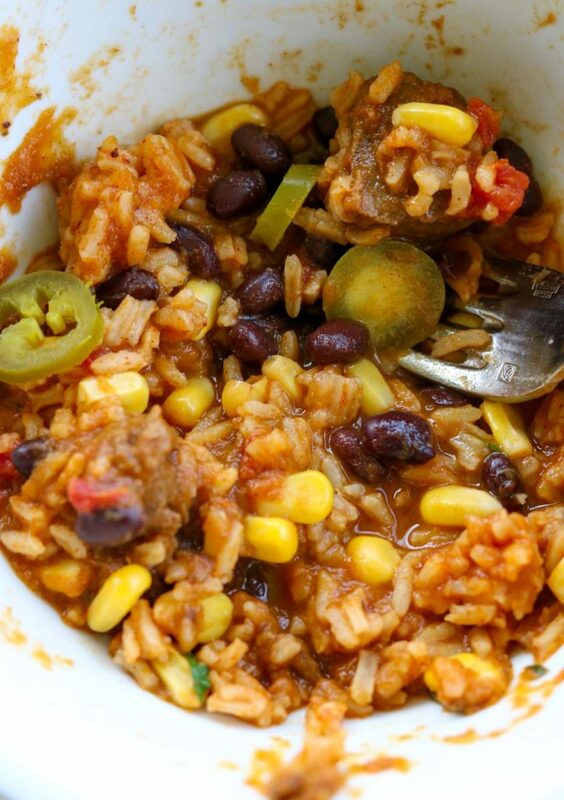 Served with corn and black beans, over a bed of rice flavored with chili powder, tomatoes and green chilies. Squeeze a few wedges of lime over top and scoop in a generous portion of spicy pickled jalapenos and you have a drool worthy dinner! Start by cutting the top round steak into 1/2-1 inch cubes, bite sized. The onions into 8 large pieces and the peeled carrots into 1 inch chunks. Set the Instant Pot to saute mode and add the oil. Saute the steak for 5 minutes until it is browned on the outside. It is okay if it is still a little pink in some spots. Turn off the saute mode and add the onions, carrots, and all the spices (leaving out the tomato paste, vinegar, and sugar. Those are added later). Stir to coat the beef and veggies with the seasonings. Add the beef broth and close the Instant Pot, seal the top pressure valve, and set it to cook on meat/stew, high pressure for 20 minutes. Meanwhile start your rice on the stove top. Add the rice, tomatoes, cumin, salt and water to the pot and cook over medium high heat until the pot comes to a boil. Then turn the heat to low and cover the pot, cooking for 16-18 minutes until all the liquid is absorbed. Once it is cooked fluff the rice with a fork and set aside for serving. When the Instant Pot beeps at the end of the 20 minutes, let the pot do a 5 minute natural pressure release. At the end of 5 minutes do a quick release by turning the top valve to “vent”. 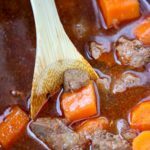 Using a slotted spoon, remove all the beef chunks from the Instant Pot and set aside. 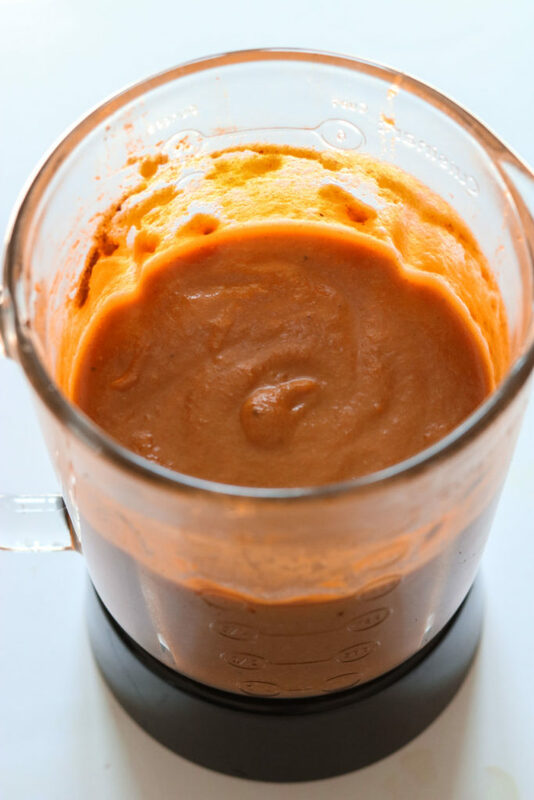 Pour all the remaining liquid, carrots, and onions into a blender or food processor. Add the vinegar, tomato paste and sugar to the blender. Blend until it is smooth, about 30 second to 1 minute. Taste the sauce for additional seasonings- if you like more vinegar tang, more salt, more chili powder, or spice (add cayenne pepper or red pepper flakes), add those now. Mix the beef with 1 cup of the blender sauce. Set the remaining sauce aside for serving. Heat the corn and black beans in the microwave until heated thru. In a soup size bowl add the desired amount of rice to the bottom of the bowl. Top one side of the rice with a portion of the beef/sauce mixture. Add the corn and black beans to the other side of the bowl. By adding toppings to your burrito bowl you can enhance the complex flavors even further. Of course it is completely personal preference, so you choose whatever toppings your family would like to use. I like a squeeze of lime, chopped cilantro, and a few pickled jalapenos. 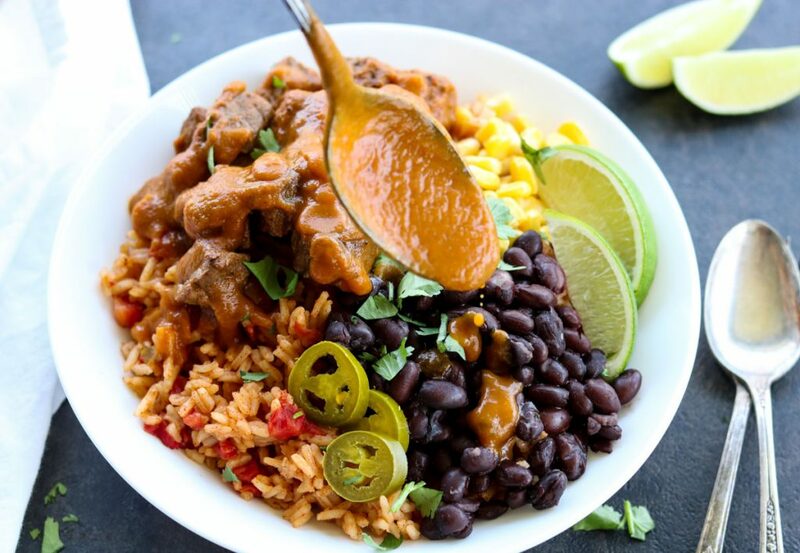 This enchilada style blender sauce for the burrito bowl is undeniable!!! The first time I made it I started eating it like soup, with a spoon, straight out of the blender! It is that good. 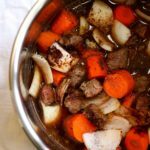 Since it is cooked in the Instant Pot with the beef it has a cooked-all-day flavor, in 20 minutes. The carrots give the sauce just the right amount of thickness and sweetness and all the seasonings create the perfect “enchilada-ey” flavor. 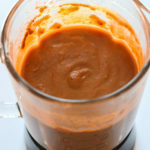 If you like your sauce a little spicier you can always add a little cayenne pepper or red pepper flakes to the blender. Believe me you will be drowning your bowl in this sauce…. or eating it straight out of the blender, like me! Add some cayenne pepper or red pepper flakes for your preferred level of heat. 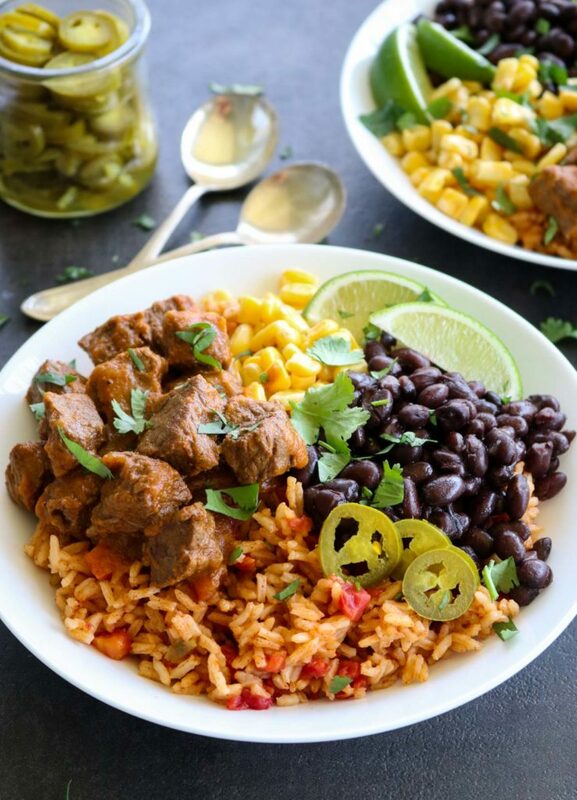 Use cilantro lime rice in the bowl instead of my red rice recipe. 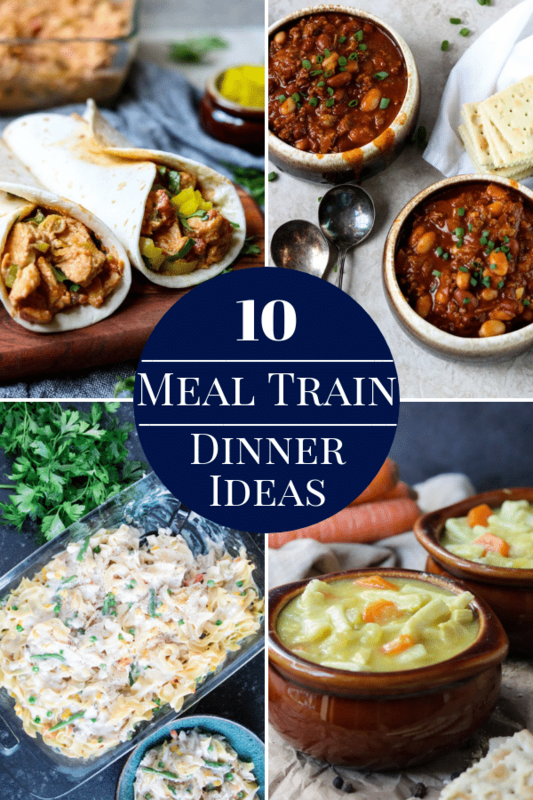 Try using Mexican Cauliflower Rice instead of white rice for a lower carb dinner. Substitute pinto beans for the black beans, or a mix of the two. Add some sweet chopped red peppers- fresh or sauteed. Ok, let’s get real about the pictures that I take… they are completely styled to look beautiful and appetizing. That is what you want to see, right!!! This dish is 100% more delicious all mixed up together with a ton of the blender sauce poured over top!! Heap on the toppings, mix it all up, and dig in! This dish is what I consider an all-in-one dinner. You have your protein, starch, and veggie all in one bowl. One and done. However it does go well with tortilla chips, my restaurant style salsa , and my rosemary paloma or grapefruit margaritas. Sometimes I will even use the chips as a spoon, we’re real casual here. If you wanted to add a fruit side dish, try my recipe for Fresh Pineapple with Citrus Herb Glaze, it goes great with Mexican dishes. Delish! 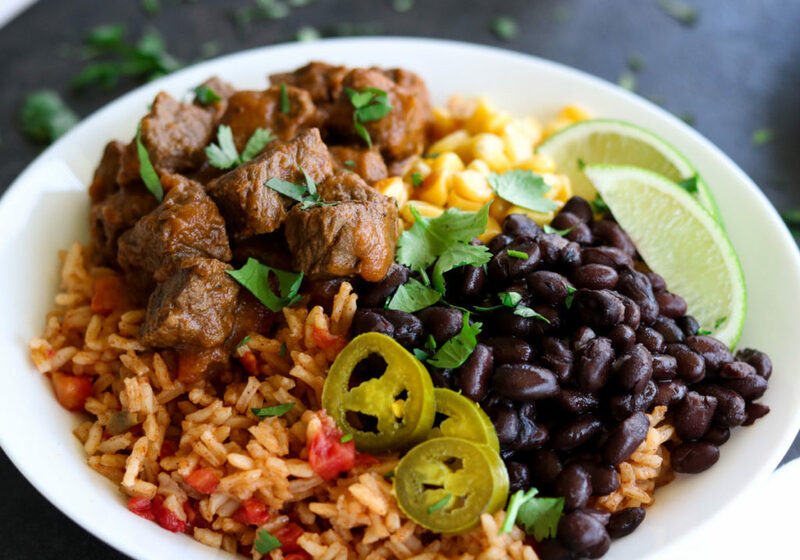 I hope you give this recipe for Instant Pot Burrito Bowls a try in your kitchen. Don’t forget to save this recipe! Pin it here. 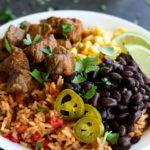 Easy, made at home Burrito Bowls, full of tender steak, beans, corn, and Mexican rice all topped with a flavorful enchilada style blender sauce. Turn your Instant Pot to saute mode, add the oil and the steak. Saute the beef, stirring occasionally, until it is browned, about 5 minutes. Turn the saute mode off and add the carrots, onions and chili powder, cumin, garlic powder, oregano, onion powder, clove, and salt. Stir to coat the steak and veggies with the seasoning. 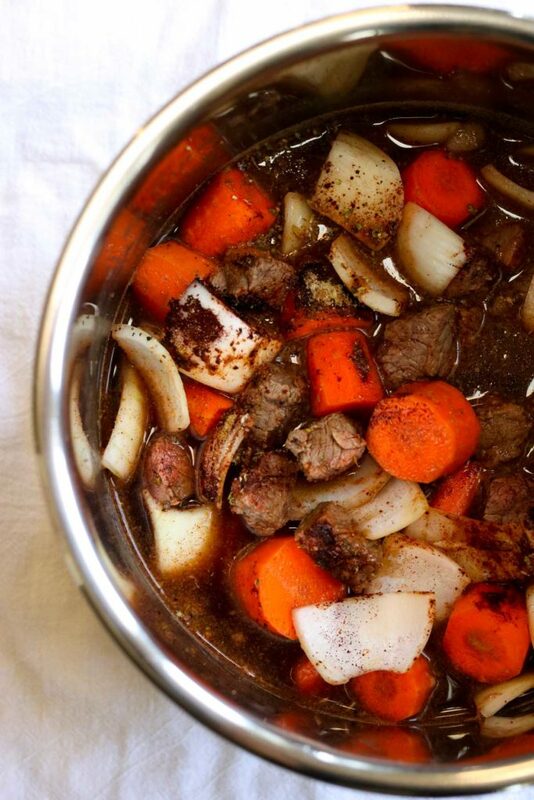 Pour the beef broth into the pot. Close and lock the lid on the Instant Pot. Seal the pressure vent on top. Set the pot to Meat/Stew mode for 20 minutes. After the 20 minutes, let the pot do a 5 minute natural release. At the end of 5 minutes turn the pressure valve to "vent" and do a quick release. Using a slotted spoon remove the steak chunks from the pot and set aside. Pour the remaining liquid and veggies into a blender or food processor. Add the vinegar, sugar, and tomato paste. Blend until smooth, about 30 seconds. Mix 1 cup of the blender sauce with the steak, stir to coat the beef. Set the remaining sauce aside for serving. Heat the corn and black beans in the microwave or on the stove top. In a large pot on the stove top add all the ingredients for the Mexican Rice and stir to combine. Bring to a boil over medium high heat. Once the pot comes to a boil lower the temp to low and cover the pot. Cook for 15-18 minutes until all the liquid is absorbed. Fluff with a fork for serving. Add desired amount of Mexican Rice to the bottom of the bowl. Add one portion of the steak mixture, black beans, and corn to the bowl. Pour desired amount of the blender sauce to the bowl and any additional toppings you would like. Dig In!!! Heather, Thank you so much for catching this and letting me know!!! I see that it did not get added to the ingredient list. It is added now, 2 cups beef broth. 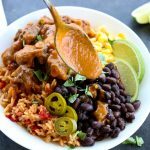 Not only does this look so good but I love that you made it in and instant pot! 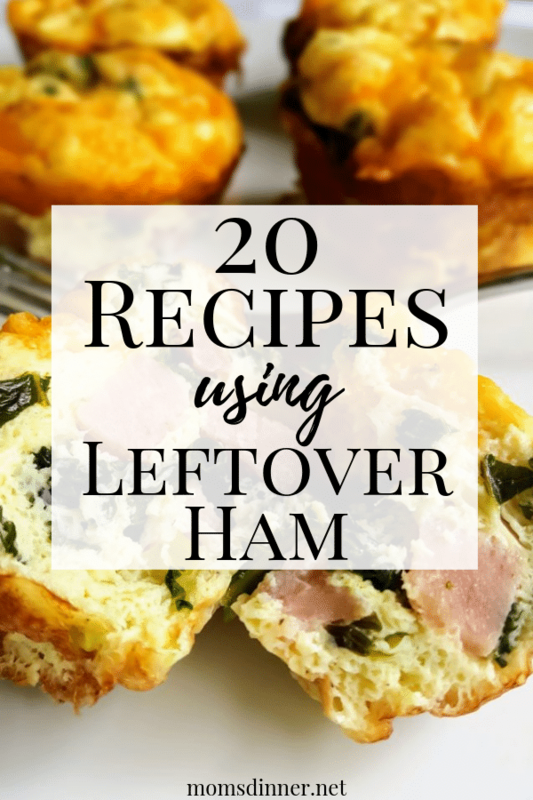 I love finding new recipes that I can try in it! 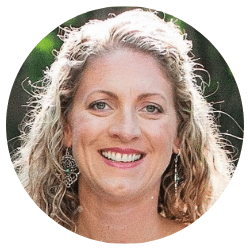 Don’t you love your Instant Pot!! I’m obsessed with mine. I have only had it since Christmas, so I can’t wait to try some summery dishes in it! Love everything about these bowls! 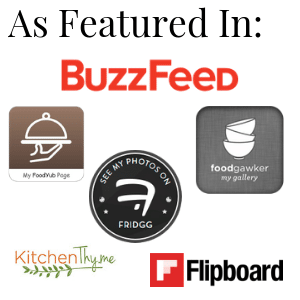 They are so flavor packed – and talk about a variety of textures all in one place! Also – love that enchilada sauce!! Thank you!! They are so delish, definitely flavor packed! The sauce really makes it.. and it is pretty healthy- thickened with carrots! I really need to get myself an instant pot. I keep seeing so many amazing things you can make in them and I love a burrito bowl! 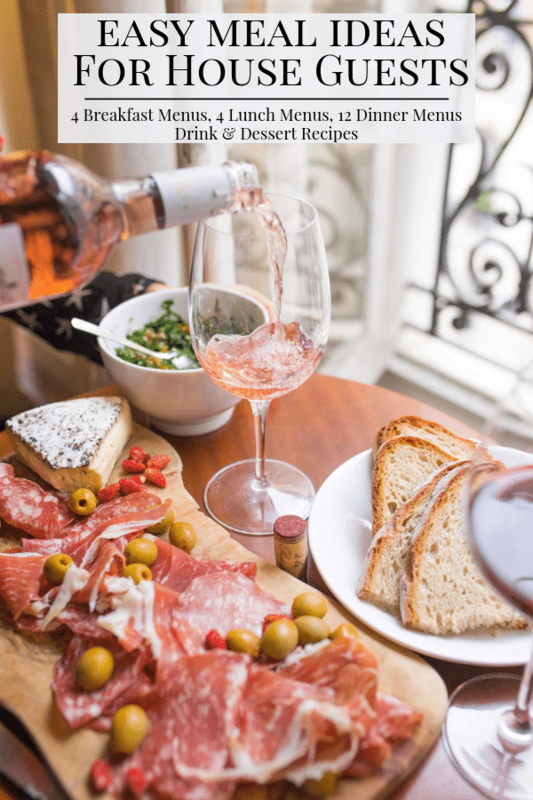 My eyes jumped to the recipe so quick when I saw the title. What a great way to enjoy Mexican style food. And so quick too. Love that there’s black beans in there. It is SOOOO delicious! It does come together pretty quickly- love my Instant Pot! I love how easy my pressure cooker makes dishes like this. Your recipe looks wonderful and super convenient for lunch prep during the week!